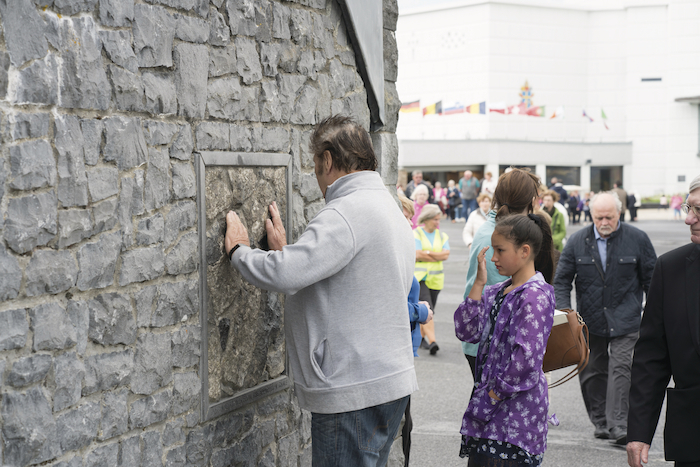 Knock Shrine is gearing up for the arrival of upwards of 45,000 pilgrims along with media from more than 30 countries for the visit of Pope Francis to the national shrine on Sunday morning. The visit of the pontiff is the first such papal visit to the country since 1979, when Pope John Paul II came to Ireland, and when almost 10 times as many people as are expected on Sunday attended the shrine where he said Mass. Pope Francis will arrive in Ireland West Airport at 9.20am where he will be greeted by a delegation of clergy and representatives from the airport along with 100 local school children who will welcome him to Mayo. From there he will depart for Knock Shrine, where upon his arrival he will move through the crowd in the Popemobile, before spending some time in silent prayer in the Apparition Chapel before delivering a short address to the assembled pilgrims and leading them the Angelus prayer. The Pope will address the pilgrims from a specially constructed stage located to the right hand side of the Apparition Chapel. When Pope Francis leaves there will be an open air Mass said afterwards, while the Pope returns to Ireland West Airport to fly back to Dublin where he will lead the closing Mass of the World Meeting of Families in the Phoneix Park. The whole event in Knock is expected to be over in around an hour. The access to Knock Shrine will be closed off to the general public following 9am mass on Saturday morning, with only those in possession of a ticket able to access the papal visit on Sunday morning. Access to the Shrine will re-open on Sunday morning at 5am, with the two car parks for the event-one on the Kiltimagh Road and the other at Ballyhowley on the old road to Claremorris open from 3am to accommodate early arrivers. The venue is just a short walk from the car parks to the venue. Both car parks can take in excess of 10,000 cars. Road closures will be in place in Knock village except for residents from 6pm on Saturday evening, while the N17 between Claremorris and Charlestown will be closed from 12 midnight on Saturday to at least 6pm on Sunday evening. For those who are due to fly out of Ireland West Airport on Sunday only those named on airline passenger lists and those bringing named passengers will be able to access Ireland West Airport between midnight on Saturday and 11.30am on Sunday. Bus Eireann is operating an expanded service on the day as is Irish Rail which will have shuttle buses from Claremorris to Knock, but only those in possession of a train ticket can use this service and advance booking is necessity.